"Panorama", the title track, was written for the Commission Project in Rochester, NY. This song was inspired by the multi-media artwork of Linda Q. Corman. "The Little Horses" is a lullaby that my wife enjoys singing to our kids. The arrangement is influenced by the writing of Booker Little and John Coltrane. Using only minimal chord changes during the solo section creates a dream-like atmosphere, free of any pretense or preconception. "Wooly Mammoth" was written for my friend Adam Chasnow. "The Wooly Mammoth" is actually a nickname for a vintage coat Chas bought at a flea market on 25th Street. The huge fur collar and cut of the coat harken back to the funky times of the early 1970�s. The groove established in the tune conveys the confidence and strut of the wearer of such an article of clothing. This piece is influenced by the music of Miles Davis and John Scofield. The intro on "Giant Steps" is one way to get through the chord changes. The ascending chromatic line starts on the flat five and works its way up. The tempo also accelerates, but never to the blazing tempo that is symbolic of many of today�s harmonic weight lifters. Fast is great, but I wanted this version to be more relaxed. "Alexicon" (language of Alex) was written for Alex Norris, a friend and great trumpet player whose harmonic vocabulary is very modern. I attempted to compose and improvise using similar vocabulary that is subtle and works naturally like the blues scale does. "Patience Is A Virtue" was written for the great jazz singer and pianist, Andy Bey. I tried to articulate musically all the valuable words of advice Andy has given me. The form is a blues with a few harmonic twists. Patience finally pays off in the 6/8 sections which provide a release. I first heard "Lucky To Be Me" on the record �Everybody Digs Bill Evans�. It quickly became one of my favorite ballads. Brother Bob�s guitar sets it all up with a thoughtful statement of the verse. On "Cousin Mary", I wanted to try something a little different. The arrangement takes you through the keys of Ab, Bb and C. It is so easy to play when the rhythm section is swinging like this. In this arrangement of "Hi Fly", the alternating 11/8 and 4/4 bars on the melody provide suspense. Is this ball going to be caught at the warning track or is it going to travel just far enough to be a home run and win the World Series for the Red Sox? Given the groove established by Dwayne and Andy, it is clear that they are celebrating in Bean Town. 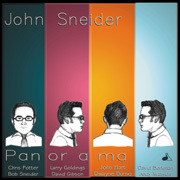 Truly a Panorama of music and creativity, John Sneider�s debut release is a gem with a broad view of the jazz art form. From the opening title cut, his original jazz waltz �Panorama,� to the final cut, Randy Weston�s �High Fly,� one finds a beauty, joy, and breadth of experience that is prevalent throughout this recording. Unusual by today�s standards, John has a sound. Sneider projects an assurance and sophistication that belie his age, and as a leader, demonstrates an empathy for the tradition of the small band jazz heritage. In this new century of the jazz art form, with a plethora of recorded product called jazz, this recording is an oasis of originality. It is sure to be a long term career springboard for Sneider�s jazz aspirations. The participation of Larry Goldings partnered with John Hart and Andy Watson in the rhythm section is a master stroke. Their inclusion evokes the classic organ trio sound, both in Sneider�s diverse originals and the hard-swinging Coltrane classic �Cousin Mary.� Capitalizing on this basic tenet, swing, John shows a maturity and insight beyond his years that will assure an audience as broad as the title. Sneider handles the litmus test of Coltrane�s �Giant Steps� with ease and allows his colleagues to share much of the spotlight in subsequent cuts. This is not only a sign of musical confidence but of true leadership. Check out brother Bob�s inventive pathway in John�s interpretation of Bernstein�s often neglected ballad �Lucky to Be Me� and Chris Potter�s solo on �Patience is a Virtue.� Also lending their unique talents to this recording are David Berkman, Dave Gibson and Dwayne Burno. They offer pure economy of musical motion to support their friend and leader. Unlike many new issues, this CD doesn�t need to say urgently �look at me now.� It is more in keeping with John�s �Patience is a Virtue.� It allows the listener to reflect and enjoy a broad landscape of music that evokes the true sense of jazz, creativity and improvisation. John Sneider has gained national recognition as an innovative jazz trumpet player and composer. In March of 1998 John was the winner of the Carmine Caruso International Jazz Trumpet Competition sponsored by the International Trumpet Guild. John was also one of five finalists in the Thelonious Monk International Jazz Trumpet Competition. In 1991 he was selected as the top collegiate jazz soloist by Down Beat Magazine. Besides leading his own groups, John has performed with Max Roach, Curtis Fuller, The Mingus Big Band, The Frank Foster All-Star Big Band, Clark Terry, Cab Calloway, Andy Bey, Brad Mehldau, and Larry Goldings. In addition, John composes and arranges music for television and radio commercials. He also leads an active career as a studio musician. Sneider is on the faculty of The New School/Mannes College of Music where he teaches jazz theory, improvisation, as well as private students. He is also a clinician at colleges, universities, and high schools around the country. John was born in 1969 and was raised in Brockton, Massachusetts. His first instrument was piano and it was not until high school that trumpet became his primary instrument. John earned a Bachelors degree in Political Science from the University of Rochester and a Masters in Jazz from Manhattan School of Music.